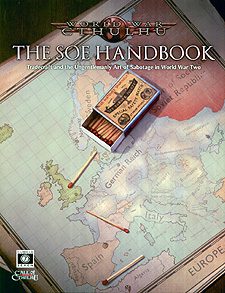 Drawing from real Special Operations Executive training materials and catalogues, The SOE Handbook for World War Cthulhu presents players and Keepers with a wealth of information about combat techniques, tradecraft, the ungentlemanly art of sabotage and the sometimes bizarre weapons and equipment developed for Britain's secret war. Plentiful sidebars translate these techniques and items into Call of Cthluhu game mechanics. The book is also peppered with notes from the mysterious N, steering members of his network through the added complications of applying this knowledge to battles with more eldritch foes. The SOE Handbook also presents details of a selection of SOE training facilities and the sometimes eccentric personalities who may be encountered there. This allows the Keeper to include mission-specific training, along with the occasional side mission on home soil, as part of their campaign.